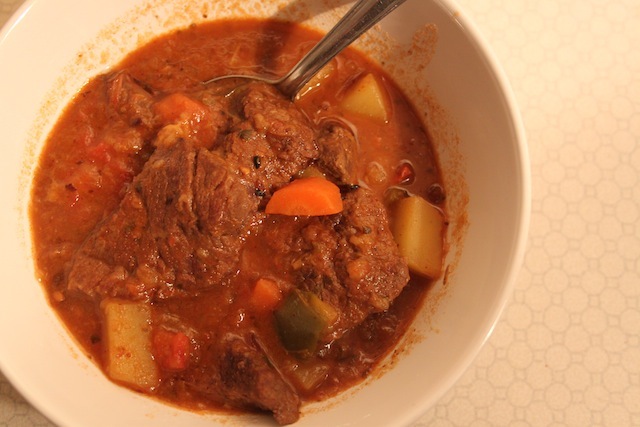 Stew, Baby, Stew: Hungarian Goulash – Eat Me. Drink Me. How can you go wrong with a recipe that has both bacon and wine? 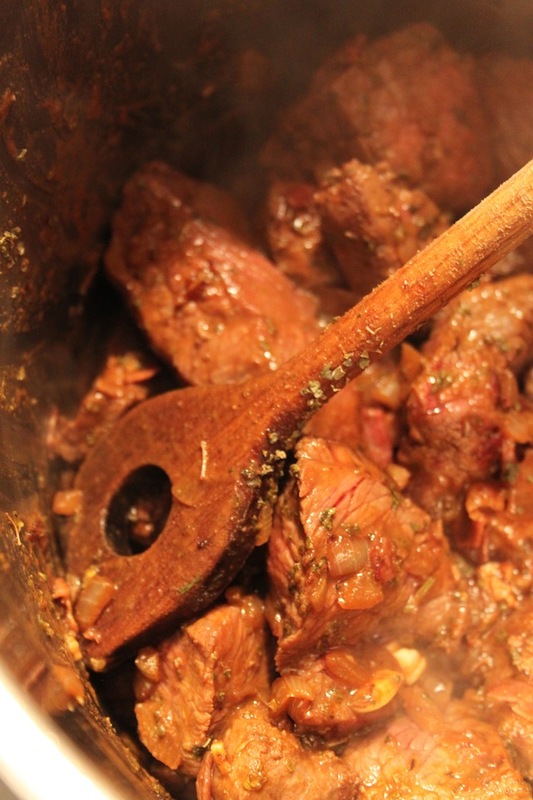 You can’t, as I discovered making this variation on Hungarian Goulash. Authenticity aside, this hearty, heavy winter stew was exactly what I needed coming back to Berlin after two weeks on a beach in the north of Colombia. Here in Berlin, where I find myself wearing all of the clothes I own at one time, there’s no action too petty to warm up. Like showering multiple times a day because it’s the warmest place in the apartment. Or reneging on sunlight because it just might be warmer with the shutters closed. Or begging my boyfriend never to leave the bed just so that it’s always warm when I want to go to sleep. 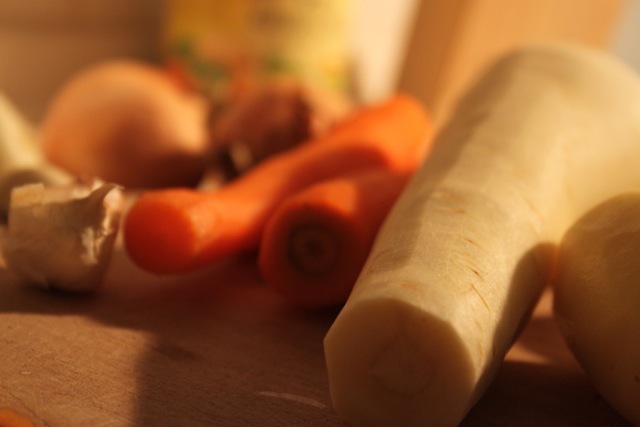 i am making soup as I type. So you see, it was a goulash challenge. It seemed, however, as though there was always something keeping me from making goulashy goodness – whether illness or projects or time – and it’s not until now, in winter-weathered Berlin that I don’t just have the inclination to make goulash, I have the need. It’s warm. And this goulash will certainly keep you warm on a cold night. It’s got everything you need for maximum belly-fullness – potatoes, carrots, melted meaty slivers of beef, bacon and stewed tomatoes – as well as some surprises like white wine, dried marjoram and liver. Serve it with rye bread, the rest of the white wine. For dessert – an episode of bad TV and the covers, pulled up to your chin. Heat bacon in a soup pot and when it’s just cooked but not crispy, add onions, butter, and paprika and cook until onions are glassy. Pat liver and chuck dry and cut into stew-sized pieces. Add to the pot and brown the meat, stirring infrequently, about 6 minutes. Add marjoram, caraway and flour and stir frequently for 1 minute. Add wine (be sure it almost covers the meat) and bring to a boil, then turn heat to a simmer and cook covered for 1 hour. In the meantime, coarsely chop potatoes and bring to a boil in lightly salted water until just tender. Set aside. 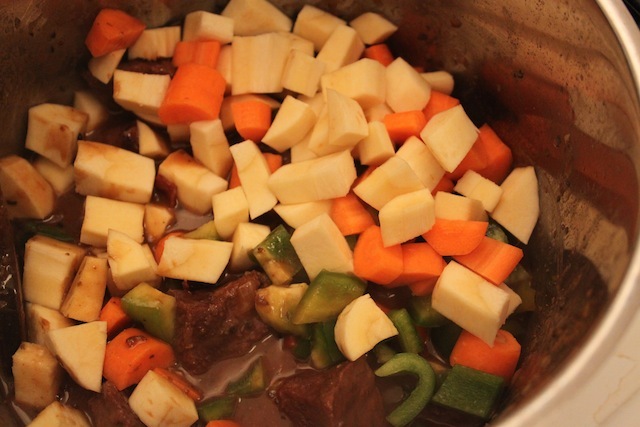 After your goulash has been simmering for an hour, add chopped carrots, parsnips, and bell pepper. 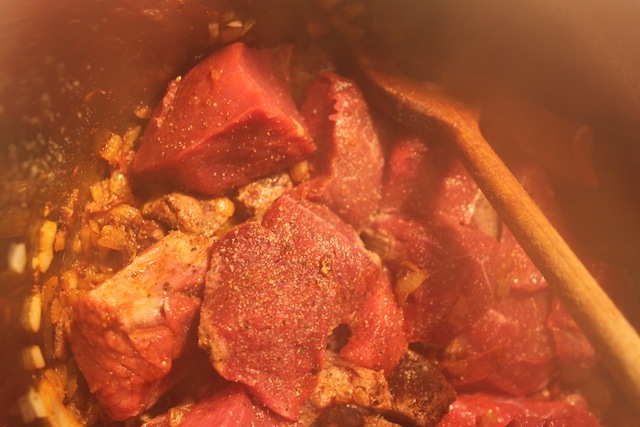 Add enough of the potato cooking water to cover the meat and bring the goulash to a boil. As soon as it comes to a boil, turn the heat back to low and simmer, covered, for 1 hour. Add potatoes, tomatoes, and Hungarian pepper. Turn heat up to medium and simmer uncovered for 30 minutes. Season to taste with salt and pepper. Oh my goodness! I have to make this…soon!